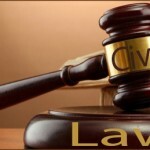 Civil law, as opposed to criminal law is the branch of law dealing with disputes between individuals and/or organizations, in which compensation may be awarded to the victim. For instance, if a car crash victim claims damages against the driver for loss or injury sustained in an accident, this will be a civil law case. A lawsuit is a civil action brought before a court of law in which a plaintiff, a party who claims to have been damaged by a defendant’s actions, seeks a legal remedy. A lawyer who specializes in civil litigation is known as a “litigator” or “trial lawyer.” Lawyers who practice civil litigation represent parties in trials, hearings, arbitrations, and mediations. Although the majority of lawsuits are settled and never even get to trial, they can expand into a very complicated process. A civil litigation lawsuit is started as soon as the plaintiff files a written complaint. The defendant must then respond and deliver a written “answer” to the complaint in order to make any kind of plea. Whether you are entering the civil litigation lawsuit as the plaintiff or the defendant, it is important to have a qualified and specialized civil litigation lawyer by your side. Contact us to be put in touch with a local attorney that can assist you with your legal problem today!